Duchess and Silverpaw made their way through the forest in silence. 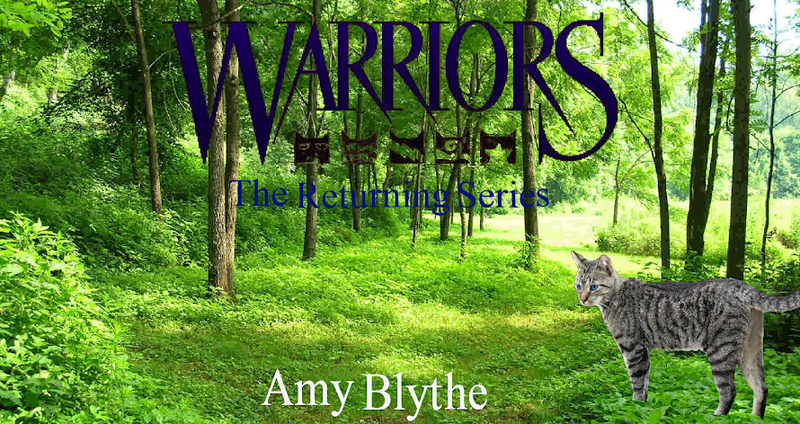 Silverpaw led her through the dense bracken, and over fallen logs. The leaves on the forest floor crackled softly as they walked. After a while, the trees began to thin, and the woods opened up into a mossy, moonlit clearing. On the far end of the clearing, a creek gurgled it’s way onward sending it’s merry sound to Duchess’s ears. A light breeze ruffled her pelt. It felt strange on her neck. She had been used to having a collar on for so long that she didn't remember how it felt. It was glorious! She wondered how she had put up with it for so long now that she remembered what it felt like not to have one on. She breathed in deeply the earthy smell of the moss . Suddenly, she tensed pelt bristling. She tasted the air again. A cat! Duchess’s eyes darted back and forth, scanning the clearing. Finally she spotted it: it was sitting on the far end of the clearing with it’s back towards the two young arrivals. Duchess glanced nervously at Silverpaw. He was striding confidently across the clearing towards the other cat. She relaxed. That cat must be Ravenstar, she thought. “Hello, Ravenstar,” Silverpaw greeted the cat. Out of respect, he dropped to the ground in a low crouch. Duchess copied him. Ravenstar jerked around, eyes wide and hackles up. She relaxed as she realized who it was. “Hello, Silverpaw.” Her gaze shifted to Duchess. “Hello, young one.” The she-cat’s reddish-brown fur shone in the moonlight, and she carried her head proudly. Duchess could tell she was a cat to be respected. A look of amusement flashed across Ravenstar’s face. "Stand up, both of you." She turned to Duchess. "I see you found the hole that my apprentice and I dug for you this afternoon." Duchess's eyes widened. "You dug that?" she asked, amazed. Ravenstar nodded. "Yes, we were hoping you would decide to venture out into the forest." Fear clutched Duchess, it's icy claws prickling her pelt. Ravenstar let out a mrrow of laughter. "Don't worry, young one. We mean you no harm." Confusion filled Duchess's mind, but before she could ask anything more, her stomach let out a loud rumble. Awkwardly, she looked down at her paws, trying to act as though nothing had happened. Ravenstar’s eyes softened. “Are you hungry?” she asked. Duchess nodded, embarrassed to be appearing like a helpless kit in front of this wise and noble warrior. Ravenstar turned to Silverpaw. He was crouched on the mossy ground. “Silverpaw,” she beckoned. “Go and fetch some prey for—er, what was your name?” she looked at Duchess. “Duchess,” came the quick reply. Ravenstar nodded, and then continued: “Go and fetch some prey for Duchess." Dipping his head, he turned to leave. "And be quick about it,” Ravenstar added. “Alright. I’ll be back in no time!” he promised. Then off he bounded. Duchess watched him leave. She fought back a prick of fear that tugged at her pelt. Timidly, she glanced back at Ravenstar. She was watching her intently. Duchess tried to hold her head higher, not wanting this Clan leader to see that she was nervous. She met her gaze steadily. Duchess’s eyes widened. “You have?” she asked. “But why?” confusion filled her bright blue eyes. But Ravenstar’s next words surprised her even more. “How would you like to join ThunderClan?” Ravenstar asked. She spoke steadily, and Duchess could tell she was serious. Stunned, she didn’t know what to say. She tried to speak, but no words would come out. Ravenstar took a deep breath before answering. Her expression clouded with pain, she softly replied, “From the first moment I saw you, you reminded me of someone that I love very much. She was an excellent warrior—quick, brave, and loyal—everything she needed to be. And more, sometimes. And then that someone was taken away from me.” She paused before continuing, “And now, I can’t help feeling that StarClan has sent you to us to make up for taking Lilystripe.” She gazed thoughtfully at Duchess. Duchess looked down at her paws. She thought about her sister, Ginger. Leaving Ginger had been one of the hardest things she had ever done. She loved Ginger, and her heart still ached when she thought about her. She could understand Ravenstar's pain at losing a loved one. Some things that Ravenstar had said confused her, though. Like StarClan—who in the world were they? And why would they take a cat from ThunderClan? But she knew that now wasn’t the time to ask such questions. They sat in silence for a few moments, each absorbed in their own thoughts. Then Ravenstar shook herself, as if trying to scatter the gloom that had settled over her. “Where is your collar, Duchess?” she asked, changing the subject. “A sign from StarClan,” Ravenstar breathed. A look of confusion flashed across Duchess’s face. Who was this mysterious StarClan? Hurriedly, Ravenstar continued, “But back to the point. Would you like to join ThunderClan?” Her gaze was steady, and piercing. Duchess knew she would have to answer this time. “Can I have some time to think about it?” she meowed hesitantly. Just then, Silverpaw came trotting out of the undergrowth, a plump vole dangling from his jaws. He came over to them, and set the vole down in front of Duchess. “Here you go,” he meowed, pushing it towards her with his nose. “Thank you, Duchess murmured. She bent her head down to sniff the vole. It smelled delicious, and her stomach gave another loud rumble. Silverpaw’s whiskers twitched amusedly as he watched her take her first bite of fresh kill. Gingerly, she took a small bite. It was wonderful! Much better than the dry food her housefolk fed her! Eagerly, she continued eating until it was gone. She licked her lips, then sat up and began grooming herself. Ravenstar and Silverpaw had moved a short distance away and were obviously discussing something. They spoke in low murmurs, and Duchess couldn’t make out anything they were saying. “But—“ Duchess started, but was cut off. “He will be back at dawn tomorrow for your answer,” Ravenstar told her. Ravenstar turned to leave. “Think very carefully about what I have said, Duchess,” she called over her shoulder. Then she padded away and disappeared into the shadowy forest. Duchess looked at Silverpaw. He beckoned to her with a flick of his tail, and the two cats once again made their way through the thick undergrowth. They traveled in silence until they came to the fence. Once they were there, Duchess timidly asked, “Who is StarClan?” She didn’t want Silverpaw to think she was dumb, but she was dying to know. She had been thinking about it the whole way back. Silverpaw looked a bit surprised by her question, but replied, “StarClan is made up of the warrior ancestors from all four Clans that have died.” He paused, and looked up at the starry sky. “They watch over us from the stars,” he explained. Duchess looked up at the glittering night sky. “So what did Ravenstar mean when she said that StarClan took Lilystripe?” she asked. “I’m so sorry to hear that,” Duchess whispered. The two young cats gazed up in silence at the sky. Finally Silverpaw broke the silence. And with a flick of his tail, Silverpaw melted back into the forest. Duchess squirmed under the fence. It was a lot easier without her dumb collar getting in the way. She crossed the yard, and hopped onto the back porch. Before going inside, she turned to look back up at the stars. Can StarClan see me right now? she wondered. Sighing, she crawled into the kitty-door.